The nominees for this year’s Game Awards ceremony have been revealed, with several Canadian-made games being represented across a wide variety of categories. The Game Awards, which are produced and hosted by Canadian games journalist Geoff Keighley, look to honour both AAA and indie games on consoles, PC, mobile and virtual reality. Several esports-related categories have also been added for this year’s show. Nominees are selected by a jury of global media and influencer outlets, while the winners are determined by a blended vote between the jury and fans. For the 2018 Game Awards, the highly coveted Game of the Year (GOTY) category includes two Canadian-made nominees — Celeste (Vancouver’s Matt Makes Games) and Assassin’s Creed Odyssey (Ubisoft Quebec). The other four GOTY nominees are God of War (Sony Santa Monica), Marvel’s Spider-Man (Insomniac Games), Monster Hunter World (Capcom) and Red Dead Redemption 2 (Rockstar Games). Celeste is a particularly notable nominee, given that it’s the only indie title among the otherwise massive AAA game-dominated category. What’s more, the entire Matt Makes Games team is made up of only eight people, founder Matt Thorson included — even more impressive when considering that the other games were made by hundreds or even thousands of people. Outside of GOTY, Celeste is also nominated in the Games for Impact, Best Score and Best Independent Game and categories. Quebec City-based Sabotage Studio’s The Messenger shares a nomination for Best Independent Game while also being up for Best Debut Independent Game. 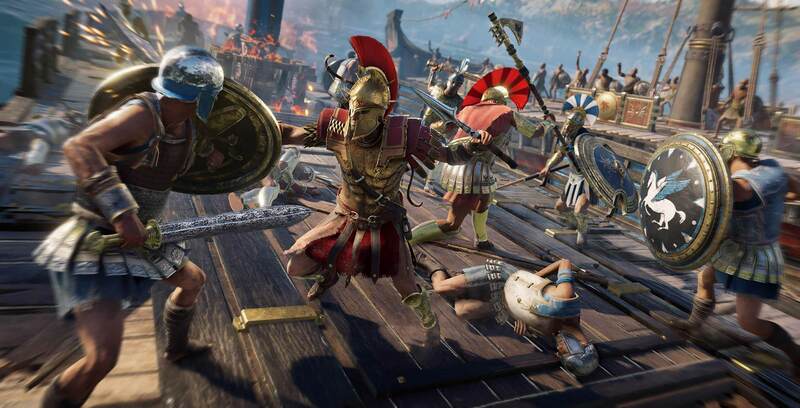 Meanwhile, Assassin’s Creed Odyssey is also nominated in the Best Art Direction and Best Action-Adventure Game categories, while actress Melissanthi Mahut, who provided the voice and motion-capture for Odyssey‘s lead protagonist Kassandra, is nominated for Best Performance. In the Best Ongoing Game category, Ubisoft Montreal’s Rainbow Six Siege faces off against Destiny 2: Forsaken (Bungie), Fortnite (Epic Games), No Man’s Sky (Hello Games) and Overwatch (Blizzard). Ubisoft Montreal’s Far Cry 5, meanwhile, is up for Best Action Game. Pulling off a Canadian studio hat trick is Ubisoft Toronto with Starlink: Battle for Atlas, which is nominated for Best Family Game. Finally, EA Vancouver’s FIFA 19 is nominated for Best Sports/Racing game, while Eidos Montreal’s Shadow of the Tomb Raider is up for Best Action/Adventure Game. Given that this is MobileSyrup, it’s worth mentioning that the titles up for Best Mobile Game, while not Canadian-made, are Donut County (Ben Esposito), Florence (Mountains), Fortnite (Epic Games), PUBG Mobile (PUBG Corp.) and Reigns: Game of Thrones. The full list of 2018 Game Awards nominees can be found here. Fans can vote through that link in any of the categories. The 2018 Game Awards will take place on Thursday, December 6th in Los Angeles at 5:30pm PT/8:30pm ET. The show will be livestreamed on a variety of platforms for free. More information can be found here. Canadian-made games have traditionally had a strong presence at The Game Awards. In 2014, Bioware Edmonton’s Dragon Age: Inquisition took home Game of the Year and in 2015, Square Enix Montreal’s Lara Croft Go won 2015’s Best Mobile/Handheld. Additionally, last year’s show saw Oakville- and Regina-based Studio MDHR receiving multiple awards (and a shoutout from Prime Minister Justin Trudeau) for Cuphead.